This year I've thought hard about what word to pick. All of the words I've used before are still things I could work on, but today, driving to Starbucks to write, I was praying aloud in the car and a word came to me. Whatever journey we're on in life, I think it can often feel isolating, alone. No one else is on the same journey. To keep the faith, to keep moving forward, does require bravery. It is far easier to do nothing, to stay on the safe path or the path you are already on. Today when I reflected aloud, I thought through what the book is that I'm trying to write. While the genre is romance, the book I'm trying to write is one filled with hope, love, empowerment, friendship, community, and possibility. I reflected on all of the times of self doubt that I've had while writing, but how I've tried to dig deep and move through that. It's been tough. Years ago I found this quote from a speech given by Teddy Roosevelt. I've turned to it, time and time again, when my inner editor (the evil Helga), has returned; or when folks ask me why I would try to write when I could just teach. So, to keep me moving forward, to finish this book, to find my best self in 2019, to remind me to move forward even in the face of doubt, I'm picking brave as my one little word. When I want to give up, I'm going to be brave. I'm going to remind myself that when you're in the arena you experience victory and defeat, but that's what makes this life worth living, and it's going to be ok.
How about you? Are you making any resolutions for 2019? Or are you picking a word to focus on? If so, please share. Wishing you the best in this new year. People, I am so close. Currently my work-in-progress stands around 94,000 words. With the ending I have in my head, I'd guess I have around three chapters left. The more I write, however, the more nervous I am about what I've written. The closer it is to an actual book, the more critical I am of what I've created. I have a multitude of thoughts in my brain - what pen name to use, whether I should be creating a social media presence for said pen name and creating connections there, and how on earth to use Scrivener to its full potential. (I'm seriously in love with this writing app that I've purchased yesterday and now in the process of diving down that wormhole.) My goal for break - get a significant chunk of the ending written and write some article for Choice Literacy. Writing is my main goal this break. I love to organize. (See my love for Scrivener above. SO COOL!) One of my favorite parts of break is going through our house, pitching items that are trash, finding items to donate, and cleaning everything out. It feels like the entire place can take a deep breath when we're done. This is also why I tend to put our Christmas decorations away on 12/26. Order returns and I feel renewed. This might be one of the things I am most excited for in 2019. 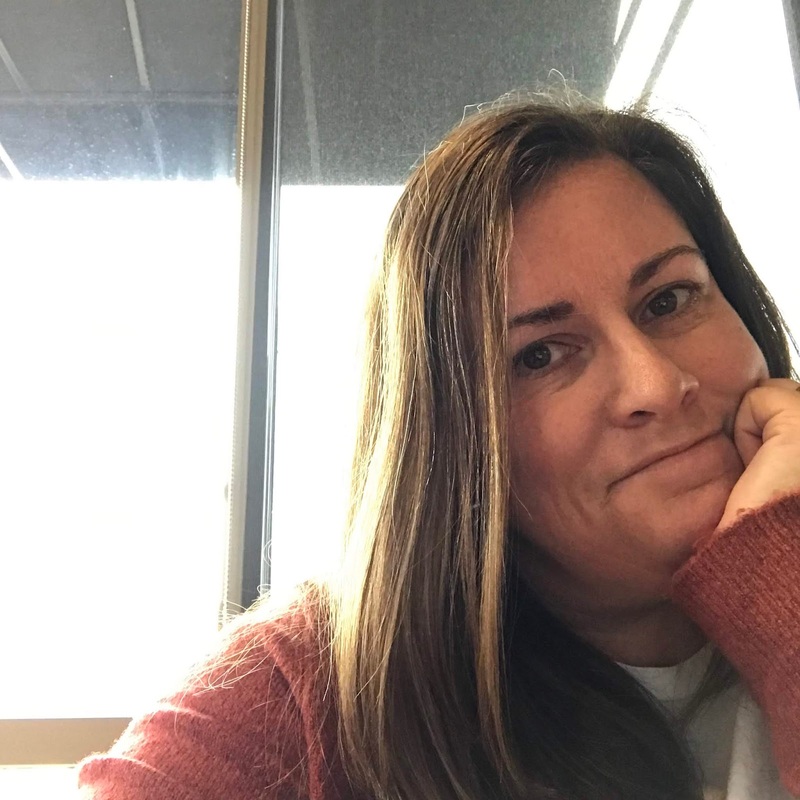 On the Voices from the Middle Podcast for NCTE I often get to interview authors and be a bit nosey about their writing process. I'm fascinated by the writing lives of others. Writing myself, and talking to other writers, has driven home the point that there is no one process for everyone. However, how often do we tell our students that they need to write in a certain manor? Every time I learn something about myself as a writer, or about other writers I've met, I share it with my students. So, I decide to reach out to other authors and illustrators, asking them to share their writing lives with the readers of this blog. (And, in turn, I will share that info with my students.) I cannot wait to begin sharing their answers with you this January. How about you? What are your plans over the next few weeks? What are you looking forward to in 2019? Whatever they are, I'm sending you wishes for a wonderful end of 2018 and a terrific start to 2019. The deadline for the 2018 NERDIES has been extended a few days. If you want to share what you've loved in Children's Literature this year, please head over HERE. Remember, you don't have to fill out every box if there is an area that you haven't read enough to nominate. Thanks! I cannot wait to see what books win this year. 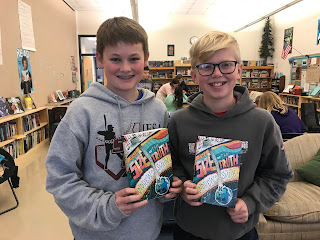 If you're unfamiliar with The Nerdies, please read Donalyn Miller's post on The Nerdy Book Club HERE. It's that time a year again. That's right, the ALA Youth Media Awards are right around the corner. This year they're announced at 8am Pacific on January 28th. My classes will be streaming the announcement and you can too at this LINK. For the past eight or so years, I've done some type of book club for one of the awards in my class. Each year I've done it differently, some years focusing on multiple awards, some years only on one. This year, I'm focusing on the Caldecott and doing the book study as a lunch option. Margie Myers-Culver and I have joined together for many years to select a list of twenty books that could possibly win this prestigious award. 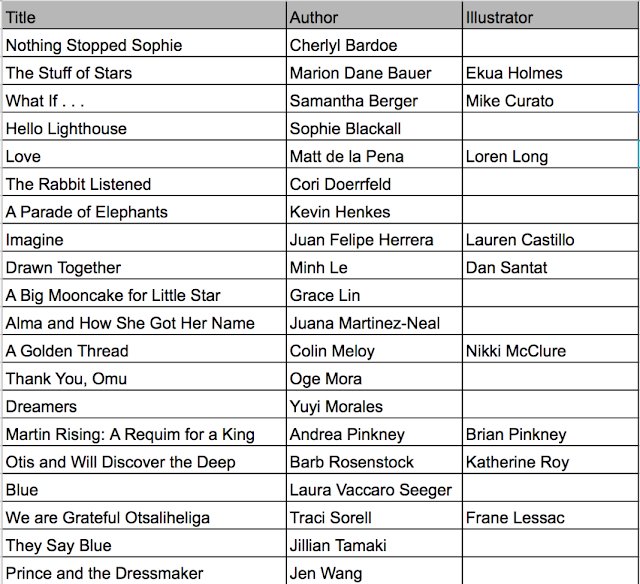 The list is never easy to come by, but that just speaks to the amazing books out in our world right now. The image at the top of the post is a quick visual representation of our twenty books, the list can also be found below. There are some amazing books on it and, hopefully, some winners come January 28th. 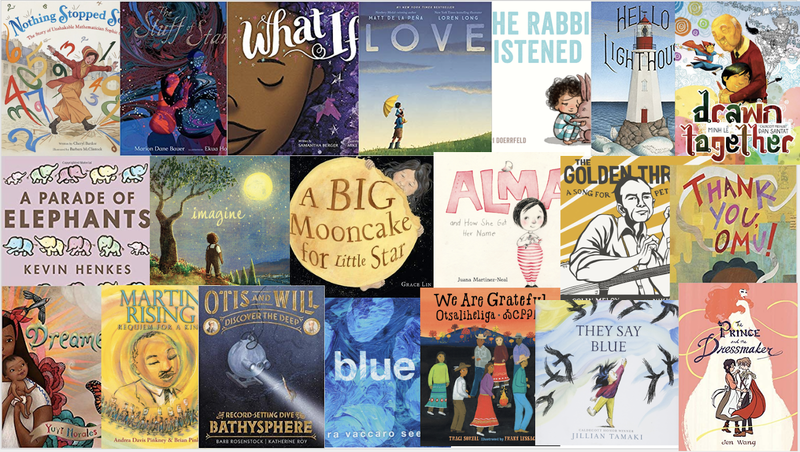 So far my seventh grade students have had ten of these fabulous books read to them as part of our Classroom Book A Day, which I've written about before. I'll read many more when we return from break. For the students who choose to come in the room to each lunch with me, we will meet during their lunch period once the week of 1/7, once the week of 1/14, and once to Skype with Margie the week of 1/21. During our first two lunchtime meetings we will debate the merits of the books on the list and then, ultimately, vote for our favorite books. When we Skype with Margie we will share our favorites and she will share hers. This year we also have a special guest and I'm so excited. Our tiny town has been lucky enough to have a independent bookstore open up on our square. The owner of Hartfield Book Company, Nicole, will also come join my class in discussing the picture books. I think it's a great chance for her to meet some middle school kids and get to know more about their taste in books. Do you have a favorite book you're rooting for come January 28th? For the Caldecott, Newbery, Printz, or one of the many other amazing awards announced that day? If you do, please share! My students are compiling their reading lists for break and I'd be glad to share your suggestions with them. Ruth Ayres is an amazing author, educator, and friend. She long ago taught me the importance of celebrating the small things, that when surrounded by a lot of overwhelming stuff, finding reason to celebrate was paramount to helping you find your way. You can find her blog HERE. I thought of Ruth this morning as I opened my computer at Starbucks. It's December 15th. I'm overwhelmed. This fall has been a time of great change, highs and lows. I feel like every day is flying while looking back and being shocked that an event from a week ago wasn't a month ago. I'm not sure I have words to express it. What I know to be true is that 2018 has been a year of loss. First my Uncle Bobby; then my dad's cousin Jim, who was like an uncle to us; then Chris's dad, Len. It's been a year of goodbyes. It's been a year of some small reminders that our health is important. It has been a tough one. At the same time, Ruth's reminder to celebrate is ever-present. I know that among my lows, there are also moments to remember. Luke and Liam both grew as runners, each in their own way, but enough to make us so proud. Luke has battled several injuries, but he still pushes himself to excel. He is his own worst critic. Liam learned that he did have so much more speed inside than he ever knew. For the past few weeks he's left the middle school and gone to the high school to run with the long distance runners there each day after school. He's loved it and is looking forward to the next four years. Chris and I had many moments to celebrate. After being married for twenty-two years, together for twenty-five, it is hard to remember a time when we weren't together. And while this fall has been difficult, we've also had the opportunity to take the kids to see Pearl Jam and escaped to Chicago with just the two of us to see Nathaniel Rateliff & the Night Sweats. Kindness makes my heart grow anytime I see it. I recently told a teacher on my seventh grade team that I thought the reason our team made me happy was that we didn't dwell on the negative. We laugh, we try and help each there when we can. I also share this with my students. 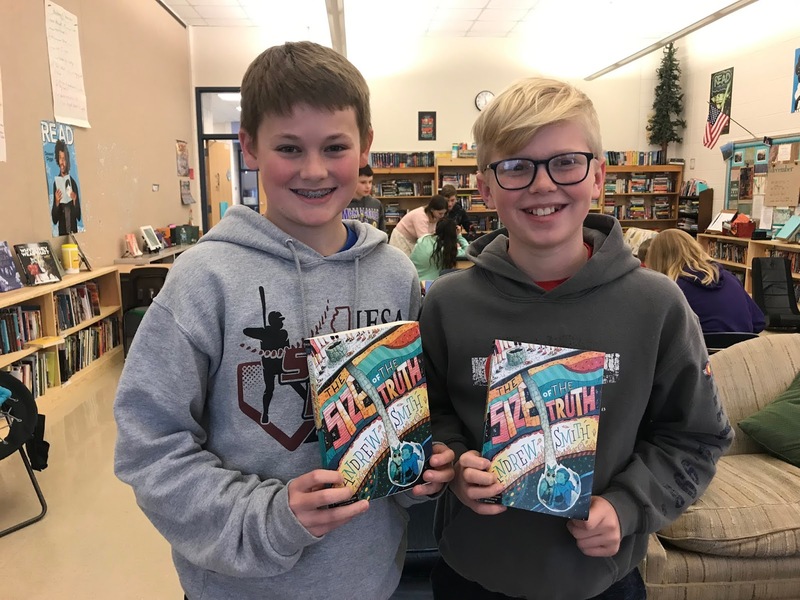 This fall two authors were kind to my students - one publicly, one in a more behind-the-scenes kind of way. Their kindness took my breath away and while I always loved their books, I am now a devoted fan for life. So if you need any young adult Christmas books, please think of Andrew Smith and Brendan Kiely. They are wonderful human beings. Small moments, when you are always on the look out for them, they are everywhere. Just this week, I've had tons of them. --> Chris and I visited a brewery yesterday in our area that is brewing a beer with Sierra Nevada that benefits the folks impacted by the California fires this fall. --> My homeroom read My Friend is Sad yesterday for our daily picture book. These big seventh graders read Piggie's part, I read the part of Gerald. One of them ran and got our stuffed animals of Elephant and Piggie to hold. My heart melted. --> I finally redesigned this blog. Let me know what you think. --> I'm at 93,000 words for my book and I think I've decided on a pen name to write under. After some of my students begged me to let them read what I'm writing (no way), I realized the importance of this once I'm done. And that's it! I hope you are well and not too crazy as we wrap up 2018. Wishing you all the best. At any rate, when Luke came home from school in those first few weeks of first grade and I asked him how his day went, he would begin to list all of the things that happened that were "bad." I would attempt to state that surely something good happened that day, but Luke would grasp on to the negative moments and I began to worry. And so began our tradition of "tell me three." The rule that year became this, whenever I saw Luke (and Liam, who was in preschool and pretty positive, but he was included) after school, they had to tell me three positives about their day. Once that was done, if they had a negative they wanted to share, they were welcome to do so, but the positives had to come first. This was not easy at the beginning. Luke would tell me that he couldn't possibly tell me three positive things, nothing positive had happened that day. I'd ask if a friend smiled at him, if he had food to eat, if his teacher was kind, etc. Gradually, it got easier. I'm a firm believer in the notion that negativity or positivity can grow when you give it attention. Luke taught me that and I've never forgotten. In any given school year this idea is put into practice in my classroom. I can choose to focus on a kid's misbehavior in my room, or I can focus on the good stuff that is happening. Of course, there are some behaviors you cannot ignore when they happen. However, if someone isn't focusing, or turning their work in, or are talking to their neighbor, etc., I try hard not to focus on it. I look for the kids that are always doing the right thing, and there are a heck of a lot of those. I want to make sure they know that I see them. I want to pour as much light into my students, into our classroom. 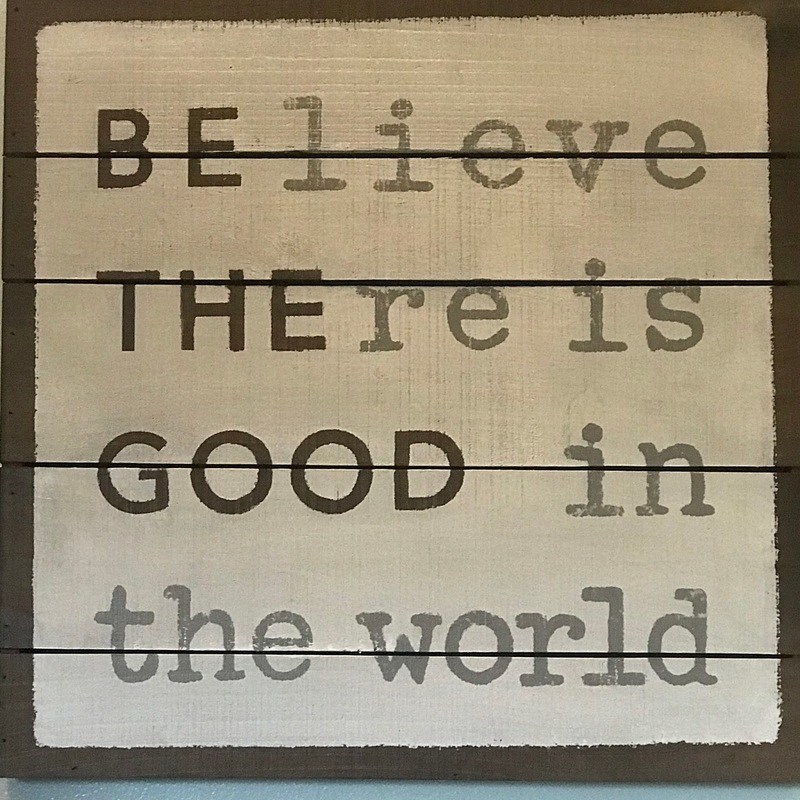 If I believe the class can do good things, if they know I believe it, we can accomplish a hell of a lot more than if I assume it's going to all go south any minute. We've had more challenging students in the last few years and I don't see that changing anytime soon. 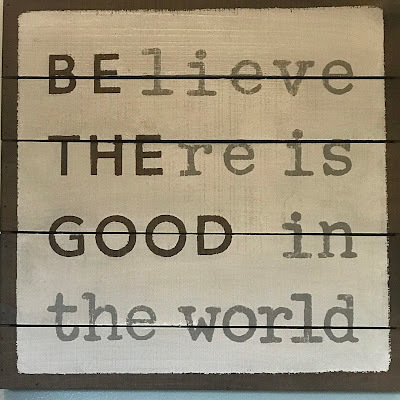 I want to remind myself on a daily basis to look for the good, to be the good. Environment is critical, morale is critical - for the teachers and the students. So I'm asking you, as I look to continue this work in my class, what do you do at your schools (or have you in the past) that you feel help promote a positive and welcoming learning environment? What do you feel helps boost teacher and/or student morale?